Imitation of Life, a film about race and identity. When I was a kid, my mother and I would often stay up late watching old movies on the Zenith console in our living room. Gosh, how we loved those flicks! 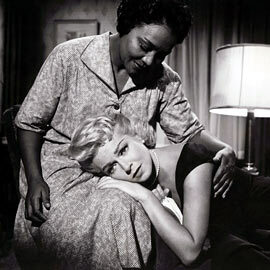 One of our favorites was Imitation of Life, a 1959 tear-jerker with a message. More than just a melodrama, Imitation of Life shines a light on female empowerment, race and class. It’s also about identity and how the color of your skin defines who you are and your place in the world. Finally, it’s about reconciling and accepting who you are. The story revolves around two single moms—one white, one black—with young daughters. The African-American mother, Annie, is played by Juanita Moore, who received an Oscar nod for her role, and the white mom, Lora is portrayed by Lana Turner, whose forte was playing long-suffering women down on their luck. If you ask me, she was the queen of heartbreak cinema. When they first meet they are both struggling to survive, and through circumstance and need, they end up living together, though not as equals. From the get go, it is clear that the only way they can live together—at least back in the 1950s—is if Annie serves as Lora’s maid. Remember, this is before the 1960s Civil Rights Movement. Juanita Moore as Annie and Lana Turner as Lora. At first, Lora, who is a struggling actress, can’t afford to pay Annie, but Annie doesn’t seem to mind. Frankly, she’s just grateful to have food on the table and a roof over her head. Conveniently, Lora’s apartment comes equipped with a bedroom off the kitchen. Otherwise known as, the maid’s quarters. Lora may have the upper hand in this relationship, but she is kind to Annie, and never bossy. She even demonstrates concern for Annie, in between running to auditions and rehearsals, but she is so self-absorbed that she doesn’t notice Annie’s troubles with her daughter, or even that her own daughter, Susie (played by Sandra Dee) is feeling neglected. The message here is that because of who she is, Sarah Jane is destined to a lifetime of racism and prejudice, no matter how many times she tries to reinvent herself. She was born to be hurt, and you see the movie make its point when Sarah Jane is violently rejected by her white boyfriend (Troy Donahue), when he discovers the truth about her identity. The scene is followed by one in which Annie is seen rubbing a tired Lora’s feet. Yet it’s Annie, whose health is deteriorating, that could use the foot massage. It’s clear, she too, was born to be hurt. These two single moms of different races, living their parallel lives, is a daring commentary of the times. Annie will always be the maid, supporting Lora as she rises to the top. But Annie, is more than her job, as Lora eventually discovers. Throughout the movie, there’s a quiet dignity and respect about Annie that makes her, in my estimation, the hero of this film. I won’t give the ending away, but suffice it to say, it’s called a tear-jerker for a reason. As many times as I’ve seen it, I still get teary-eyed. Imitation of Life is filled with stars, but special kudos goes to Juanita Moore for playing the role of Annie. Moore, who passed away last month at the age of 99, lost the Oscar to Shelley Winters, who won for her role in The Diary of Anne Frank. Having the nomination under her belt didn’t help Moore’s career take off and may have even hindered it, as future offers were few and far between. But she deserved the Oscar and if I could, I’d give it to her posthumously. The film has its flaws but see it for yourself, and take it for what it is. A film that in some ways was ahead of its time–trying to make a statement, but limited by the conventions of the times. Loving this, Monica. Very well written and so aptly titled. In the last post/poem that I published on the blog, this seems to be part of the point I was trying to make – that at the end of the day, there will be a current of prejudice and racism that my children will have to live with, navigate in, regardless of how far we’ve come or what I teach them about self-pride, etc. This isn’t to paint a gloomy or pessimistic outlook of their future, but to highlight that the history of racism and prejudice in this country goes far back and that we still have quite a way to go. Imitation of Life, though one of my favorite classics, is a difficult one for me to watch on many levels, especially as I raise my own children; nonetheless, I think it is timely that I watch it with my daughters. Thank you for the reminder. Think it’s too much for an almost-6 yo? I watched it when I was pretty young. A lot of the meaning may go over her head and if she has questions you’ll determine how best to answer. Do you remember the ending? You might want to watch it first. Good call, Monica. I’ll watch it again before I expose the little ones. Do let me know what you end up deciding. By the way, have you ever seen the film, “A Patch of Blue?” I may do a review of that one soon. On the contrary. Your responses speak your truth. Your intelligent observations and sensitivity to the issue come through crystal clear. If you do end up seeing A Patch of Blue (which is another powerful film, made in the 60s) before I write it up, send me your thoughts on it, and I’ll be sure to include them in my post. I haven’t seen this movie in many years. I think I will need to watch it again, perhaps even adding it to my movie library. Thank you for this wonderful reminder. Definitely do, Val. It’s one of the better tear-jerkers. A classic. Good. Let me know what you think! Thanks for showing and telling. I can’t count the number of times I’ve watched and cried during this movie. Definitely a classic. I have it in my collection. My daughter and I watched it when she was fairly young and it’s one of her favorites. I have it in my collection, too! Just as my mother introduced the film to me, I did to my daughter. We get so weepy together. Sigh. I HAVE to see this! Thanks for the intro! Yes, Jodi, you do. It really is one of my all-time favorites. My mother and I always watched “Imitation of Life” and another tearjerker with Lana Turner, “Madame X.” We cried like babies every time we saw both films. The scene in “Imitation of Life” where Mahalia Jackson sings is a highlight that really turns you inside out and the scene where the mother goes backstage to wait for her daughter – ohmy. Karen, Lana Turner always managed to make tear-jerkers. In fact, you could say, she was the queen of them! And yes, I love Mahalia’s singing. It adds so much to the film! Thanks for the recommend Monica. Always looking for great films I haven’t seen before and, like Robert, I also recommend To Sir With Love, another classic! By the way, love the new blog design. I’d never heard of this film before, Monica, but you’ve made it sound interesting. We get so used to living in the here and now that we tend to forget how bad things once were. Leave it to artists, writers, filmmakers, and other creative spirits to remind us, for if we totally forget, we’re doomed to repeat those mistakes. Have a super weekend, and give the boys a hug!! You are so right, Debbie, and I hope you get a chance to see the film. Would like to know what you think once you do! Wow, I had never heard of this film, but it sounds like one I would love. Thanks for the introduction, Monica. Hope you have a wonderful weekend, my friend. Please be sure to see it, and keep tissues handy when you do! — the first time I watched THE IMITATION OF LIFE I was about 13 years old. I consider it a classic, wonderful film. A scene that REALLY stuck w/ me is when Annie revealed some intimate things about her life to Lorna because of what was happening to her daughter. “You never asked,” Annie said. — this revealed an abundance about Lorna’s character thru-out the film. She considered Annie a black, ignorant maid (in the beginning) & I never grew to like her! Kim, I’m thrilled you’ve seen it too, and know what I’m talking about. I remember that scene. It just drives my point further, that Lora is so self-absorbed she doesn’t see the real Annie, who is so much more than just a servant. Monica their are a few films similar to this one, where race is a issue in the eyes of some. One classic must be “To Sir with Love.” It was an accurate portrayal of Britain at that time. It is available to buy here on Amazon and to rent on iTunes, I will choose one of the two options and have a look at it.. Yes, I’ve seen To Sir…and it’s quite enjoyable. I especially love the tittle song performed by Lulu. It’s one of my favorite all-time songs. But Imitation pulls at your heart, and you can acutely feel Annie’s pain. What a film. I’ve never seen or heard of this movie. It sounds wonderful. I’m adding it to my movie list. Thanks for sharing. Would love to see a list of your favorite movies of all-time. Thanks, Savvy. I will write more about some old films worth seeing. They may be from another era, but the stories they tell are so relatable even today. I hope you do watch Imitation of Life, and when you do, please let me know what you think of it!